St. Francis International School is an independent, co-educational school at the service of the international community in Rome. The school is based on the American system of education and structured to meet the needs of the international student. 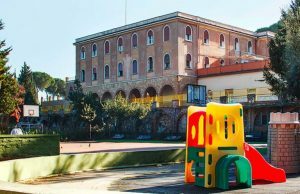 The school, situated in the north of Rome, is housed in a purpose-built facility and is fully equipped with a library, a cafeteria, a gymnasium, a computer room thirteen classrooms, a basketball / volleyball court and an extensive and green play area. Children are prepared for the Italian state exams (5th and 8th grade) by qualified, experienced teachers.